Lebanon is a uniquely beautiful country and the city of Beirut is a revelation. The architectural reconstruction is a great success and there is a wonderful atmosphere amongst the restaurants, which spills out into the streets. Many of the pilgrims will remember the inauguration of the Beth Myriam on Wednesday with the heat, the crowd and the tasty cakes! I wonder what the neighbors thought! Celebrating Mass at the Basilica of Harissa, Bishop Felix Toppo of Jamshedpur, and Bishop Anil Couto of New Delhi, (India) with Bishop Joao Evangelista Terra of Brasilia, Brazil. In his welcome address the Cardinal spoke of the importance of the ecumenical movement and reminded us that the Catholic Church has a special commission, headed by a Cardinal, studying and promoting ecumenism and working towards Christian unity. The Cardinal is a Maronite, who spoke clearly about the importance of the Maronite identity, telling us that there are Maronites in many different countries. In this way, the Cardinal reminded us of the fact that the Roman Catholic Church includes different Rites and spiritual traditions. The Cardinal spoke about the divisions between Christians, saying, "I ask God to forgive us all our offenses and to bring us back to unity. We urgently need Christian unity." He reminded us that Lebanon has a special significance in the work for unity. Continuing, the Cardinal said, "In our country, as you know, we have eighteen denominations with six different groups of Catholics (different Rites), five Orthodox groups, and the rest Muslims. These are divided into Sunni and Shiite and Druze and so forth, and that is why Lebanon is considered the melting pot for all peoples." This was followed by an audience with the President of Lebanon, Mr. Emile Lahoud. In one day, some of us met a Cardinal and a President. Back home we may not even get to meet the Mayor, but Jesus takes us through many doors, into many palaces and places of worship, only to remind us later that we are all God's children and that all those who seek God must also visit the poor. In the end we simply ask where Jesus wants to take us next, and we understand that, because of Him, the whole world is a palace, and everyone is extraordinary. President Lahoud recognised the importance of True Life in God worldwide and said that our presence in Lebanon shows that this country is special because of how all denominations live together in the spirit of solidarity, forgiveness and cooperation, and so Lebanon is, as the late Pope (John Paul II) said, more than a country; it is a message, and this small country is now and will continue to be a witness to the world. The President thanked Vassula for the work of True Life in God in supporting the poor (a reference to the Beth Myriams). In a special way, this was Mary's pilgrimage. From the blessing of the Beth Myriam and with the opening Liturgy, we were made aware that we had been joined by another pilgrim! It was as if she had said at Harissa, "Don't leave me behind!" and we didn't. The next church we visited was also dedicated to Our Lady; Our Lady of Mantara, at Maghdouché. The main celebrant of the Mass was the Melkite Greek Catholic Bishop, Georges Kahhale. The homily was given by Fr. René Laurentin, who spoke about the Blessed Trinity. We celebrated the Liturgy of St. John Chrysostom and once again there was a deep sense of unity as Orthodox and Catholic and Anglican priests stood together around the same altar. The Bishop is Catholic, in union with Rome, but it was the Orthodox who knew the Liturgy whilst the Catholics and Anglicans had to read the French translation. According to Mark 7:24, Jesus visited the area of Tyre and Sidon, Saida today, to preach the Gospel and to heal the sick. According to a tradition stretching back many centuries, the Virgin Mary came with her Son, but because at that time Jewish women were forbidden to enter pagan towns, the Mother of Christ waited for Him in the cave at Maghadouché. The Roman road from Jerusalem to the Lebanese coast passed through this village. Here, Our Lady waited, praying and meditating. In this beautiful shrine she has the title: Our Waiting Lady. Our visit to the shrine was surely one of the most moving experiences of the pilgrimage. Once again Our Lady was reminding us of her presence. It was as though she was saying, "I have been waiting for you because you have come with Jesus, My Son." This area is also associated with the prophet Elijah who visited a widow and her son in Zarephtha, or Sarepta, a Sidonian town. Here he spoke words of prophecy which were not only about himself, but about the woman and her son, showing God's care for each person, and through him the good God multiplied the little flour and oil that the woman had used to feed the prophet. Later when the son became seriously ill, God healed him through the ministry of His prophet: hospitality shown to the prophet of the Lord brings blessings from Heaven (1 Kings 17: 7-16). Eventually we were all on our coaches heading for the border - ecumenism on wheels. There were fifty clergymen amongst the 281 pilgrims. 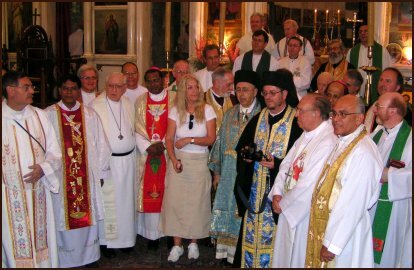 Ten Christian denominations were represented: Roman Catholic, Anglican, Greek Melkite, Ukranian Orthodox, Greek Orthodox, Coptic Orthodox, Romanian Orthodox, Armenian Orthodox, Lutheran and Maronite. Our pilgrimage was also graced with the presence and participation of a Buddhist, a Muslim and a Hindu. 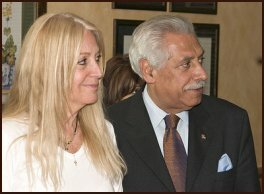 Forty countries were represented: Argentina, Armenia, Australia, Bangladesh, Belgium, Brazil, Canada, Chile, Columbia, Czech Republic, Denmark, England, France, Germany, Greece, India, Ireland, Italy, Japan, Lebanon, Mexico, Monaco, Netherlands, Norway, Philippines, Puerto Rico, Poland, Romania, Russian Federation, Scotland, Singapore, South Africa, Spain, Sweden, Switzerland, Taiwan, Thailand, United States, Uruguay and Venezuela. Lebanon is a country of questions, challenges, opportunities and blessings. The Lebanese hymns and church music are unique and deeply moving, expressing both sorrow and joy, but especially joy. God is praised in many ways, in many hearts, in many countries. The languages are different, the music is different but we sense the unity of hearts. It is possible to hear the language of the heart without understanding the words! Lebanon is mentioned seventy-one times in Holy Scripture. The cedars of Lebanon are associated with strength, and the imagery of the cedars is used in references to both bad and good men, but Psalm 92 says: "The righteous shall flourish like the palm tree, and grow like a cedar in Lebanon." The cedars and their scent, and the streams of Lebanon are part of the metaphorical description of the loved one in the Song of Songs, a poem about God's love for His people, and in particular, for each soul. In the Second Book of Chronicles we read that cedar wood of Lebanon was used by King Solomon in the construction of the Temple in Jerusalem. Beauty, strength, fragrance, and the sign of true worship; such is Lebanon according to the mind of the Lord. The journey to the Lebanese/Syrian border was uneventful for most of us, but one coach was held up on both sides of the border for about three hours. This was an opportunity to exercise patience and good humor. In spite of the occasional wave of anxiety on board, most people, with God's help, managed to remain calm and in good spirits. The writer was one of the pilgrims on this bus. One priest from the United States later mentioned jokingly that everything seemed to go wrong around him. Both he and the bus quickly acquired notoriety and visitors to the bus, including Vassula, were warned not to stay too long! 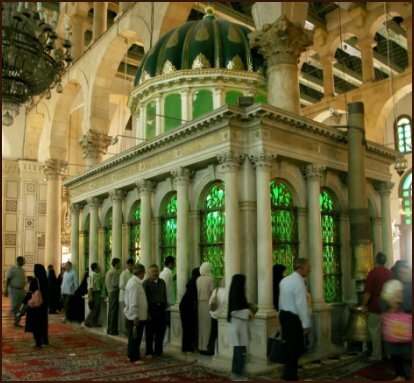 The next day, Sunday, we visited the old city of Damascus. We began with the chapel, originally a house and then a prison from which St. Paul had escaped by being lowered from a window in a basket. We also visited the Great Umayyad Mosque with its beautiful Roman courtyard and the shrine of the head of St. John the Baptist. The Mosque is a place of prayer. It was interesting to see how people felt relaxed and at home within its walls. It surely reminded us of the description of how Moses and his companions ate and drank in the presence of God on Mt. Sinai (Exodus 24:9-11); the children of Allah, at home in their Father's house, acknowledged at the door His holiness and the sacredness of the place, again like Moses, by removing their shoes. We visited the house of Ananias, now a chapel, where St. Paul's sight was restored after being blinded by the light of the Risen Christ (c.f. Galatians 11: 11-24 and Acts 9: 1-25, 22: 4-16, 26: 9-20). That evening we were joined by two dinner guests, Bishop Isidore Battika, the Greek Melkite Patriarchal Vicar from Damascus, and the Syrian Catholic Bishop, Monsignor Elias Tobbi. Bishop Isidore's speech was greeted with enthusiastic applause. He spoke about the wonderful cooperation between the Greek Orthodox and the Greek Catholic communities who chose to build a church to serve both groups. This is the church of St. Peter and Paul at Dumar. He spoke about the importance of Syria, referring to the visit of the late Pope John Paul II. "The community of Damascus supports all the history of the Church. 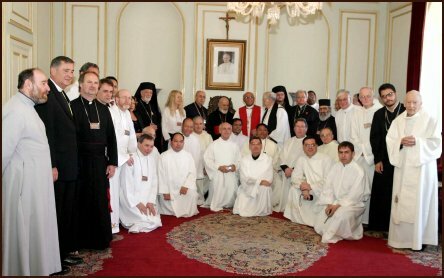 In Damascus we have the Greek Orthodox and the Greek Catholic, the Syrian Orthodox and the Syrian Catholic, Armenian Orthodox and Armenian Catholic, Maronite, Chaldean, Protestant, Anglican, Latin. Every Church is represented in Syria. Syria is very important. When Pope John Paul II came to Syria, we called his visit �Syria: Beginning of Christianity.' It is very important...Jesus begins His life between us in Jerusalem, but Christianity like a Church, begins in Syria with Annanias and St. Paul. You know the history from Acts." 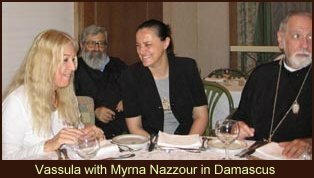 Also while in Damascus, the mystic and stigmatist, Myrna Nazzour, came to visit Vassula. In his Letter to the Galatians, St. Paul says that after his conversion and baptism he went to "Arabia" (c.f. Gal 1: 17, 18). In his book, The Apostle: A Life of Paul, the Anglican writer, John Charles Pollock, speaks about this as a time of preparation for Paul. An early tradition suggested that he started preaching immediately in "Arabia," but this does not conflict with the idea that he intended to go into the wilderness, like Christ Himself, to pray, meditate and enquire of the Lord what the next step might be. Pollock suggests the attractive scene of Paul, unable to contain his enthusiasm about Jesus, at a camp fire with his first convert, possibly a young Bedouin, sharing his meditations under the stars. Some modern commentators think it is likely that Paul's main concern was to seek solitude in order to grapple with all that had happened to him since the episode on the road to Damascus. It is probable that back in Damascus he continued his meditations until he felt ready to seek confirmation of his calling from the community in Jerusalem. He could not have been forgotten so soon in Damascus, so it seems likely that he would have remained relatively quiet there on his return. Traveling in this part of the world, even just skirting the wilderness, brings to mind the spiritual significance of the desert. Those who took part in the TLIG Pilgrimage to Egypt would have seen something of the Sahara in the distance. We also traveled through a wilderness area in which we saw signs of industry and military activity. The earlier pilgrimage to the Holy Land also brought us into the desert area on our way to the Dead Sea. But on this latest pilgrimage, we saw more of the wilderness for a longer time. Some of it is cultivated now, and there are signs of heavy industry here and there, but the sense of the desert remains. Parts of this area are found in the writings of T.E. Lawrence, of Lawrence of Arabia. The desert is very important in the spiritual life. There are both negative and positive ways of looking at the desert and, in a way, we could say that the most positive meaning of all has to do with something negative. The desert is a place of purification and sometimes preparation. Those who begin to advance in the spiritual life are eventually called into a "desert experience" where they seek only God. There is a "negation" which is necessary to spiritual growth, and it is not just a movement away from material things, but a movement away from anything that we perceive as an obstacle to a deeper relationship with God. In this sense the desert has often been described as a "cleansing" place, where the mind is relieved of its clutter and the vision of faith becomes clearer. For some, a pilgrimage can contain something of the "desert" either because of some negative aspects which are nearly always present or because of the action of the Holy Spirit who seeks to draw the soul closer to Himself. Sometimes a pilgrimage can be purifying; sometimes it is a preparation for something; for a deeper conversion, a further step along the road of discipleship, or a call to a deeper kind of prayer. "We are here, not only to follow the traces of the prophets of old, but to open a wide path in our mind and heart to see their perfect faithfulness they had towards God when He called them to reveal His designs to them: let us meditate while crossing these deserts on their self-renunciation, their self-denial, and become more aware of their untameable courage, zeal and love for God�God stripped them from all that was worldly so as to imprint in them His own Holy Image�Each one of us on this earth has been given a mission�there are those, who still do not put their hope in God nor do they trust Him but cling to what they possess and do not let go. Few are those who love God as in the first Commandment�The Lord tells us several times in the messages, not to fear this impoverishment that will not only set us free, but also set free movement of hope and ensure its opening out for the attainment of supernatural goods and of God Himself." The full text of this address can be read here. Perhaps we should read it again. On the sixth day we set out for Jordan. On the way we stopped at Maaloula, an ancient Christian town where Aramaic is still spoken. This is a fascinating place, full of wonderful traditions and legends. One of the most famous landmarks is the monastery of St. Tekla or Thecla, a follower of St. Paul. She was an early convert to Christianity who broke off her engagement to devote herself to God. Her vengeful fiancé tried to kill her by various means, all of which were thwarted by divine intervention. The legend tells us that she hid in a grotto in the cliff around which the idea of the present-day convent was built. People from different religions come to the monastery/convent to gain blessings and to make offerings. The convent houses the relics of the saint. Another landmark is the Mar Sarkis Sergius Monastery. It was built in the fourth century on the remains of a pagan temple. It was named after St. Sarkis, a Syrian knight who died in battle in the reign of King Maximanus in 297. We were privileged to have Mass here on one of the oldest altars in Christendom. The altar itself had "horns" - prominent corners reminding us of the altar of sacrifice in the Temple of Jerusalem. The sanctuary area is quite small and it was interesting to see how all the bishops and priests were accommodated. There is a wall with openings like a screen with "Holy Doors" so the people in the church could not see very much. The Christians of Maaloula are Greek Catholics. The chief celebrant of the Mass was Bishop Felix Toppo. We did not have much time to visit the city itself. We were told that the film director Mel Gibson had shot some of the scenes of the "Passion of the Christ" in this ancient place. Leaving Maaloula we continued to Bosra where we ate, and then went on to the Syrian/Jordan border, passing through desert. By now the bus groups had become little communities and there were songs, prayers and some witnessing. Some friendships had been renewed and some new ones made. People were really getting to know each other, laughing, talking about their problems, talking about God and their experience with "True Life in God." Part of the pilgrimage was the blessing of being with each other, sharing the journey, the food and the prayers. We arrived a little later than expected at the Marriott Hotel in Amman. Although some ate inside, many were directed to the pool area where some hot food was waiting. By now it was evening and growing dark and there was a cold breeze blowing outside - very cold, in fact. This was another opportunity for good humor and patience. The angels had prepared a joke for us: as we ate, music was playing over the loud speakers. It was a Christmas selection. First of all there was the song, "Winter Wonderland" which was followed by "I'm Dreaming of a White Christmas." There were many smiles as well as shivers, and the next day, a few colds! It is one of the treasured memories of our pilgrimage. Some of us then went inside and heard Vassula's guests speaking. One of them was the Anglican Bishop of Jerusalem, Right Reverend Riah Abu El-Assal, a respected figure and well-known to some of our Anglican pilgrims. We were also graced with the presence and formal welcome of Mr. Akel Biltaji of the Royal Hashemite Court and advisor to his Majesty King Abdullah II. Mr. Biltaji said, "I am here on behalf of his Majesty King Abdullah the II. We welcome you to Jordan! This is where it all began. This is the cradle of faith; walking and following the steps of Abraham, Jacob, Moses, Elijah, John the Baptist, Jesus and Mohammed. This is where Judaism, Christianity and Islam are Love in one God. This trip from what I understand from you, Vassula, is all about love, reconciliation, tolerance, and patience, that is exactly what is needed here. This land where Moses asked us all to come, this land where the Heavens opened and declared at the baptism of Jesus: "this is my beloved Son of whom I am very well pleased... We welcome you and we want you to take back with you our message: the message of Islam; we want also to reach out. Islam is love. May the most compassionate and merciful God hear us. Islam is mercy. To be a Moslem we must recognize the others. I cannot be a Moslem if I'm not a Christian and if I'm not a Jew. So this is how we, in this part of the world, believe. 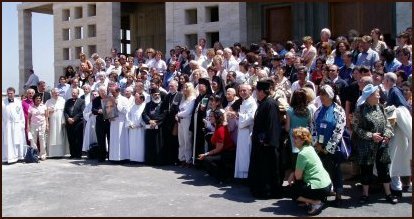 In the spirit that is now in each and every one of us, may the Lord see whether in a monastery, a mosque, sanctuary, or a synagogue, see the spirit that you (Vassula) bring with you and that I can see on their faces, the smiles, the love, from 38 countries. Politicians could not do this. Religion did that. That is why we have to always hold on to our values. I belong to a group, like Rt. Rev. Riah (Anglican Bishop). We are the followers of Jesus of Nazareth. He is our teacher. Mohammed is our teacher. Moses is our teacher. We need them all. That is why this week I will be in Nazareth, my city. Right from the Heart of Jordan in Amman, and on behalf of his Majesty, thank you for opening our hearts and our minds and eyes. We have a full moon for you tonight so you can sleep at night. We wish you a happy Pilgrimage and God bless you." The next day we journeyed to Bethania, or Bethany, on the River Jordan to the site of the baptism of The Lord. We celebrated the Eucharist in the small Orthodox Church in the heat of the day. The chief celebrant was Bishop Jeremias who was resplendent in his robes, in spite of the oppressive heat. His wonderful voice added to a joyful celebration. The fire of the Holy Spirit was certainly present! It had been in the area of Bethany that the Hebrews crossed the Jordan to enter the Promised Land. This is an important detail for our understanding of the ministry of John the Baptist. His message was "repent!" Repentance means both "turning back" and "changing one's mind," moving away from sin. We continued on our way to the Dead Sea. Some went bathing, or more likely, floating! Others, who felt the need of coolness and shade, stayed in the nearby hotel. We left there for Petra where we checked in at two hotels. We had some memorable meetings with Vassula and everyone was in good spirits. Our Buddhist and Moslem companions spoke, as did several others. The next day we went to the burning hot, ancient city of Petra where, after a long walk, we celebrated Holy Mass in a simple chapel - almost out in the open - with great joy. The chief celebrant was Bishop Anil Couto. The journey back to the bus park was hard work for some, especially if they had the courage to take a buggy ride! Some who had been here before, and knew better, rode a horse. It is likely that this is the area visited by St. Paul after his escape from Damascus. What must it have been like then? The next day we left Petra and returned to Amman. On the way we went to Mount Nebo from where Moses had seen the Promised Land (Deut 32: 48-52) and where he died (Deut 34: 1-5). There we celebrated the Orthodox Liturgy. The main celebrant was Father Hernando Garcia Garcia. After the Mass the bishops and priests were joined by our Moslem, Buddhist and Hindu friends for a photograph. The farewell dinner buffet was held at the Hotel Marriott in Amman. It is always sad to say goodbye after we have spent so many challenging and grace-filled days together. But "goodbye" often contains the hope of 'until next time' - in Greece, perhaps. Such a farewell meal is also a meal of thanksgiving for all that God has allowed us to share together. For those who were left, which was a sizeable number, there was a visit to Gerasa, or Jerash, which has wrongly been associated with a place where Jesus performed an exorcism (Mark 5:1-20, Luke 8:26-39). St. Matthew's Gospel places that event at Gadara. That is the more likely location since there seems to be no lake in the area of Gerasa, and, as we know the "Gadarene swine" ran over a cliff into the sea (Matt 8: 28-34), which sea was most probably the Sea of Galilee. However, Jerash was important for other reasons and the Roman ruins are some of the best in the world although there is little dating from pre-Christian times. The Liturgy of the day took place at the Anglican Church in Amman. The celebrant was Bishop Orlando Guerrero. We were welcomed very warmly by members of this community. A homily was given by Canon Samir J. Habiby. This was a wonderful and important occasion; the Holy Spirit was most certainly in our midst. For the vast majority, the Pilgrimage was over. Only a few were left, and they departed a day later This was a difficult and also eventful pilgrimage. There were some challenging moments and some moving experiences. During the Pilgrimage, especially in the hotels at the evening get-togethers, different people shared their insights into the messages and spoke of their hopes for unity and renewal. Some of those who shared impressed us with their courage and devotion. There was also a sense of fun from time to time and plenty of laughter. There were also a few tears; tears of joy and tears of pain. Many of us will not quickly forget the moving healing service with Exposition of the Blessed Sacrament, led by Henri Le May and Father Raphael. Did healing take place? When Christ is present there is always healing. Perhaps we will have to wait for some to share the joy of their healing before we really understand how blessed we were on that evening. One of the most important blessings of any True Life in God Pilgrimage is the presence and participation of Vassula. Christ has chosen her to be our special guiding light. She did not fail us. From the beginning, the Mother of Jesus was present, and Mary remained with us, encouraging us, especially through the Rosary, and like a mother, helped us remain childlike when the journey was hard. The Lord Jesus, of course, was everywhere: "We, Us!" on the buses, in the dining rooms, in the private conversations, with those who laughed and with those who cried. Above all, we are called to loving intimacy with Him. This call was repeated and renewed on our 2005 Pilgrimage. Without this intimacy we cannot advance, for without Christ there is no True Life in God.